A chain-reaction crash sent a man to hospital and two others to the psychologist to heal the trauma after seeing their cars destroyed. 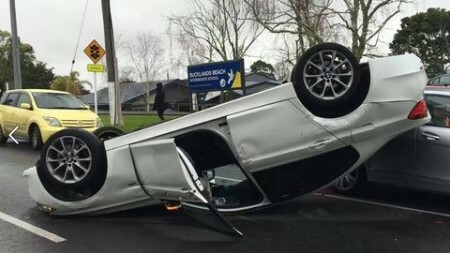 Four vehicles were involved in an accident outside an Auckland school in New Zeeland. 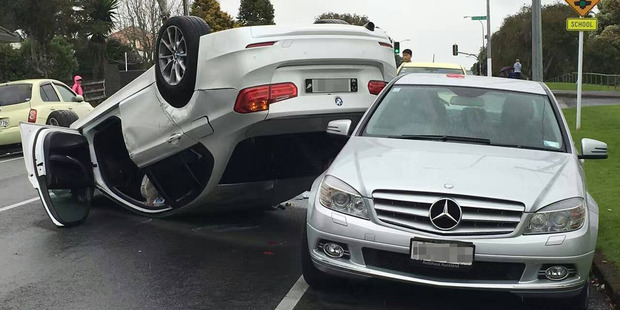 A Mercedes-Benz got a BMW rolled right over it. The photos posted on social media show the white BMW turned upside down, with the rear leaning against the broken window of a silver Mercedes-Benz C-Class. A golden Honda and a grey Suzuki Swift were also involved in the crash. The emergency services were called to the crash scene outside Bucklands Beach Intermediate around 10:50 in the morning, as somebody reported a multiple-vehicle collision. Three of the cars involved in the accident, the Mercedes included, were just parked outside the school, when the BMW driver came full speed and slammed into them. Luckily, the drivers of the parked cars were not on board their vehicles, so the only one who needed the paramedics’ help was the man behind the wheel of the flipped BMW. He was taken to St. John hospital for further investigation. Preliminary results show that he was not under the influence of alcohol nor drugs. Anyhow, he will be charged for the entire damage caused to the three cars.